Some imaginative companies are now tapping into consumers’ minds and passions to co-create products, solutions, communications and “experiences” that are truly resonant. These companies are finding new ways to engage creative consumers in collaborative conversations at the “fuzzy front end” of the innovation process. Traditional consumer research has long focused on revealing “unmet needs” as input to a company’s technologists, designers and marketers whose role is to then interpret the findings and conceive new products. While conventional consumer research provides an essential foundation, it no longer creates a competitive edge, as some companies are now thinking very differently about when and how they engage consumers. Now, in addition to taking the temperature of a representative sample of consumers and combing the data for “insights”, some companies are experimenting with non-traditional, sometimes radical and untried approaches that seek upfront inspiration – and actual ideas – from creative consumers who have a passion to innovate. -Electronic Arts, a maker of computer games, ships programming tools to its consumers, posts their modifications online and builds their ideas into new games. -BMW posted a toolkit on its website that lets customers develop ideas in telematics and in-car online services. -In 2004, 120,000 people around the world signed up to join Boeing's World Design Team, an internet-based forum that includes message boards and discussions with the Boeing design team on what members like or dislike about air travel today, as well as features they'd like to see in their dream airplane. -Lego allows programmers from outside the company to access to the code that controls its Mindstorm toy robot, leading to an increased range of activities the robot can perform, in ways the company never imagined. -Coors Light and Mercedes Benz invited consumers to co-create advertising campaigns, with Mercedes encouraging proud owners to submit snapshots of themselves with their vehicle. Consumer Ideas, "Unarticulated needs" & "Ideation Springboards"
Since engaging consumers can be expensive and unpredictable, companies are now looking for new ways to derive the most benefit out of these interactions. Traditional data-driven consumer research is still the norm in the majority of companies. When qualitative focus groups, web-based surveys and other interpersonal methods are used it is typically to validate internally-generated concepts or thinking – not to generate new ideas. Qualitative consumer research often focuses on what customers say, but does not explore the fertile ground of their unarticulated (latent) needs. The “Voice of the Consumer” has become a standard part of the toolkit of marketers and researchers across most industries, but working with the spoken word is relatively straightforward. Furthermore, since competitors are using the same kinds of established methods this provides little competitive advantage. Experimenting with non-traditional techniques unfamiliar to competitors helps drive deeper insights and identify opportunities that have a greater degree of relevance and “emotional resonance” with consumers. There are two reasons to solicit consumers’ actual ideas. First, these ideas provide valuable insight into unarticulated consumer issues, motivations and aspirations – the things they are trying to accomplish. Second, while many consumer ideas may be unfeasible, this “wishful thinking” can be used as “ideation springboards” for the design, marketing and R&D team. Highly impractical, imaginative thinking is often the essential spark for breakthrough concepts. The trick is to seek out the “concept nuggets” hidden within consumers’ unrealistic ideas and to marry them with market, technical and other realities, in order to envision something that’s feasible. 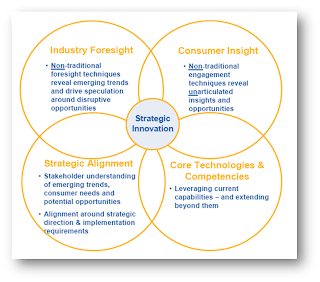 There are several fresh approaches to consumer involvement that might spur a company’s innovation efforts to new heights.